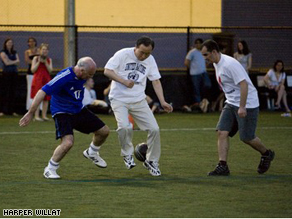 UN Secretary General Ban Ki Moon plays soccer with other world diplomats on Saturday in New York City. Jakob Lund, a 26 year-old student from Denmark, never thought about the issue of child’s play until last year when he was living in Sierra Leone. At the time, he was working with a non-profit organization when one day, walking back from work, he stumbled upon a couple of children who invited him to play soccer with them. Jakob soon realized that their soccer ball was completely destroyed so a couple of days later, when he presented them with a new one, they responded with great excitement. Many of these children in Sierra Leone have been affected personally by an 11-year civil war that left thousands of citizens killed and millions displaced. Based on their reaction to this simple soccer ball, Lund saw the amazing potential of healing that the sport could bring to these young lives. So Lund got the idea to found the organization Play31, which uses the unifying power of soccer to bring together people whose lives have been torn apart by armed conflict. As stipulated in Article 31 of the UN Convention on the Rights of the Child, one of the very basic rights of a child is the right to play. This article, Lund maintains, is what inspired him to carry out his idea; by encouraging people to donate soccer balls and funds to facilitate community gatherings, one could help contribute to the creation of peaceful societies where children can exercise this right. It was a beautiful evening in New York City, 80 degrees with a slight breeze, as over 20 UN diplomats ran onto the soccer field at Pier40 and competed (in civilized fashion of course) against one another. The biggest surprise of the evening? UN Secretary General Ban Ki Moon, who, at the age of 64, participated in the entire game and stayed after to chat with journalists and other curious souls about children’s issues. It isn’t every day that one sees such an important figure head publicly engage in such a humble activity, but he did it with great enthusiasm and, in true diplomatic form, he even played for both teams. At the end of the evening, it was Team Lichtenstein that took home the trophy – but I think it’s safe to say that on a night like that, everyone went home a winner. Editor's Note: Lund’s organization is supported by private donations. For more information, visit the website: www.play31.org. I love your show AC! it's amazing that soccer has such a big influence across the world. It gives hope that soccer will get more popular with Americans. What about the war between el Salvador and Honduras in 1969? The Guerra de Futbol. At times, the Beautiful Game can also be dangerous, it seems! The beautiful game has just become even more beautiful! Amazing project that deserves all the support it can get. It's a wonderful initiative and something that is clearly needed, hence the support from Mr Ban Ki Moon. It is something that everyone at Play31 should be truly proud of and I commend Jakob Lund for his positive thinking. Football can save the world, that's what I've always said! Great project and very cool that the Secretary General of the United Nations took time out to come and show the world the importance of the beautiful Game! yet another way that soccer brings people together. truly the best sport in the world. from politicians to chefs to priests to kids in Sierra Leone(probable spelled that wrong) Soccer unites. This is a truly fantastic project! Kudos to everyone at Play31 as well as to the committed team of UN Ambassadors! Wow, the power of sports can be immense! And this also shows that the UN is not just a big cabal of bureaucracy . Respect to the Ambassadors, Mr. Moon and Play31! I love the idea of this charity! Soccer is a MAJOR sport outside of the U.S. and it definitely unites small communities and countries, especially the children. In a world where there's so many issues it's beautiful when children can almost forget about the tragedies that surround them and simply play soccer. Kudos to Mr. Lund! I'm glad to have heard some great news outside of the swine flu scare! Social projects related to sports provide health, education, leisure and training to communities. The power of sport and football has been channeled into projects much larger than the four lines of the field. It's possible to use the football as part of social inclusion. In Brazil, many former football players have founded schools of football and they make an important work in poor communities. The focus is on education, not in the training of athletes, but in developing a better human being, responsible for their choices. Play 31 – Excellent work! Excellent initiative! Work as these should be disclosed and supported. I have never heard of "Article 31 of the UN Convention on the Rights of the Child" before, that's interesting. See news can be uplifting! This is awesome! I think it's great to see the UN show support for a grassroots project. Kudos to Ban Ki Moon for getting out in the mix..
How absolutely fantastic... Well done Jakob Lund... Well done Diplomates... What a beautiful thing.